"Surprising NYC coming-of-age story evoking laughter and to tears, and the possibility of redemption"
Abraham Singleton tells his story, from conception until he reaches the age of adulthood. Most would say that at his eighteenth birthday, he becomes a man, but Abraham has one foot in the adult world long before he reaches the legal age, thrown there by generations of circumstances beyond his control. He claws and scratches his way to maturity, fighting against stereotypes and low or false expectations, always aware�if not fully believing�that there's a bigger, better world available to him if he can only continue to fight, and live, long enough to get there. HOLD LOVE STRONG was surprising in so many ways. Many fiction books touch my emotions. Some make me laugh; some raise my hackles. Few, if any, make me cry. HOLD LOVE STRONG brought me to the brink of tears, not one but twice. Yet, this story also wrought those other emotions in me too. It make me chuckle at remembrances of the fun and positive side of growing up in an urban environment. It also made me angry to recall what it's like to deal with folks and situations that are determined to bring a person down despite his best efforts. The most surprising aspect about this book is that the author, Matthew Aaron Goodman, is white. Now, that's not to say that white authors can't write books about the Black experience in America. I don't believe that to be true. However, Mr. Goodman writes almost as though he's lived the Black experience, likely a by-product of his close, caring and observant relationships with the students and other professionals in the NYC school system, not to mention the rest of the city. It becomes obvious Mr. Goodman looks beneath the surface, seeing and empathizing with the individuals hidden below perpetuated and oft-times erroneous assumptions made about them and their circumstances. At the same time, he pulls no punches, pulling back the covers and exposing the elements of the urban environment that are all too negative and raw and lead to the stereotypes easily enjoyed by the media. 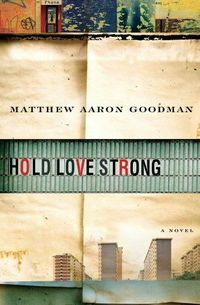 HOLD LOVE STRONG may be the best urban coming of age story I've ever read, especially as it holds the promise of triumph for young Abraham Singleton and as such serves to let today's youth know that it is possible to transcend a difficult beginning. In this poignant tale of self-discovery, a young man struggles to survive the New York City housing projects in the face of familial, communal, and personal devastation. Born to a thirteen-year-old in the bathroom of his family's small apartment, Abraham Sing leton enters a world laden with the obstacles inherent in an impoverished community. In spite of the crack epidemic and the HIV crisis that ravage their neighborhood, the Singleton family -- cousins, an uncle, an aunt, Abraham, and his mother -- is held together by Abraham's heroic grandmother, whose deep faith and stoic nature have always given them a sense of wholeness and hope. But when the family goes through several harrowing losses, not even his grandmother may be strong enough to lead them through. At the center of this story is Abraham, the youngest of the Singletons. Deeply intuitive and cerebral, he is determined to thrive in a place that has destroyed the dreams of those around him. College means opportunity, yet it also means leaving behind those he loves. Abraham's journey into adulthood will break his heart but ultimately offer the possibility of redemption. In this haunting, lyrical, and evocative novel, Matthew Goodman composes a paean to the power of family and belonging in the African-American community. Hold Love Strong is a spellbinding coming-of-age tale about love, hope, and the will to survive, and a stunning universal story about the incredible capacity of the human spirit.